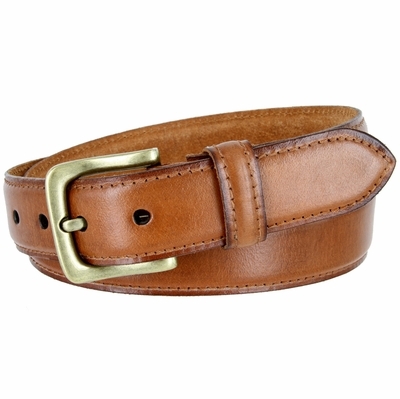 131010 Adjustable Vintage Style Casual Dress Leather Belt. 1-3/8" = 35mm wide Vintage Style Genuine Leather with Suede Lining. Feathered and Stitched Edges with 5 adjustment holes. Stitched Old English Brass Buckle and a Matching Leather Keeper. Adjustable: Belt strap can be cut down by removing the screw by the buckle. Our belt is measured from where the leather ends at the buckle end to the middle hole at the tip end.